"Let me squash the rumors right now: These two are not heroes. They're just two ordinary men who were put in an extraordinary situation and just happened to come out on top." A film like the blood-soaked vigilante/revenge saga The Boondock Saints wears its curious cult status like a badge of honor, having notoriously missed out on a theatrical run in 1999 only to discover striking under-the-radar success when it hit the video market. It became one of those talked about titles that people liked to turn others onto, at least talked about by people discovering its energetic Tarantino-esque mix of dark humor and excessive violence, as well as an array of ridiculously fun shootouts. The film still stands as the only project by writer/director Troy Duffy, and though it was released on DVD in 2002, this new two-disc "unrated special edition" (unrated = more violence) carries most of the same extras, but improves the experience by including a Dolby Digital 5.1 EX mix and an anamorphic THX-remastered transfer. Sean Patrick Flanery and Norman Reedus are Connor and Murphy MacManus, a pair of hard-drinking Irish brothers in South Boston who find themselves in the self-proclaimed role of vigilante saviors after doing battle with a group of tough Russian mobsters. Ridding their world of the evil criminal element becomes an all-consuming mission, the neighborhood considers them "the saints of South Boston", but they've attracted the attention of a very unorthodox FBI agent named Smecker (Willem Dafoe), as well as the vengeful mob, who call forth from prison Il Duce (Billy Connolly), a mythical killing machine. 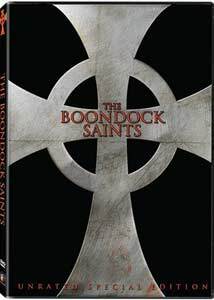 Watching The Boondock Saints it seems apparent that Troy Duffy has watched and studied the flashier parts of Scorsese and Tarantino, and his attempt at emulating and modifying their approach to filmmaking makes this part homage, part mutation. The mob undertones and grubby inner city stuff borrows from old school Scorsese, and Duffy juggles the usual flow of the narrative Quentin-style, for example showing us the tail end of a crime scene with the MacManus brothers surrounded by dead bodies. Then a scene or two later, he has the increasingly flamboyant Smecker reenact what has occurred, in a move that not only answers audience questions but allows for some beautifully shot scenes of mayhem. We've seen that kind of forward-backward-forward storytelling before for sure, but the Smecker character is just so excessively odd (three words: Dafoe in drag) that his spot-on analysis of a crime scene remain as the film's signature moments. The comparatively silent MacManus brothers hook up with a pal of theirs known as The Funny Man (David Della Rocco), a jittery wannabe bag man for the mob that Della Rocco plays like vintage Al Pacino on acid. The guy is in a constant state scowling, strutting and/or yelling, using more obscenities than Frank Booth, and at one point constructing a massive sentence made entirely of f*** that elevates the word to a new art form. Connolly, as the Hannibal-Lector-bound Il Duce, moves away from his trademark comedic presence to become a violent blend of legend and godfather in a role that is really one of the genre's greatest unsung anti-heroes, albeit a largely silent one. This isn't without its basic conceptual faults�I love how all the wall-rattling, elaborate shootouts can occur on quiet sidestreets or in fancy hotels with nary a police car or inquisitive bystander in sight�but Duffy operates with such an exuberant level of bullet-driven excess that it becomes part of the charm. And it's that fragile balancing act between near-parody and dark crime thriller that puts Duffy's film on a strange precipice, and unless you manage to fall in quickly with his weird scenarios, broadly sketched characters and shooting-on-top-of-shooting it may be hard to see what all the buzz is about. Get past that hurdle, however, and the rewards are here. Image Transfer Review: Disc one is two-sided, with a 2.35:1 anamorphic widescreen on one side, and a 1.33:1 full-frame on the flip. The print has undergone the THX remastering process, and represents a huge improvement over its original incarnation on DVD a few years back. All of that considered, I was still a bit surprised at the extent of the minor dirt and debris issues here, and though the transfer is littered with some noticeable grain and shimmer, the color saturation is rather full-bodied and deep, with black levels that are good, but not great. Audio Transfer Review: The video side may not be flawless, but the new Dolby Digital 5.1 EX mix almost makes up for the other's shortcomings. This is active, loud and very aggressive, and the frequent gun battles take on a new level of intensity. A very pleasing, if not perhaps somewhat overdone, remix that really dresses up the over-the-top choreographed violence. Extras Review: This unrated special edition may not necessarily overwhelm by the volume of new extras (most of which are found on the previous version), but it does earn a couple of brownie points for a nice-looking but awkwardly arranged packaging. Cover art is raised, and the case is metal�made by Steelbook�and opens to reveal both discs unfortunately overlapped on the right hand side in a Scanavo variant. Arrrgh. There go those brownie points. Disc 1 is two-sided, carrying the widescreen presentation on one side and the full-frame on the other. Ported over from the 2002 release is the commentary from writer/directory Troy Duffy, which isn't the most electric track I've listened to, and relies a lot on pointing out where things were shot and who's who in real life. He does touch on the cult status of the film, and how rewarding that is, and I would have preferred more discussion of things we weren't seeing onscreen. New here is a commentary from actor Billy Connolly, and even if what he was saying was dull (it's not), he has an energy that is very contagious. A few dead spots here and there, but otherwise an enjoyable ramble from a very funny guy. Jumping over to Disc 2, with filmographies, a pair of trailers and the same set of seven rough print deleted scenes�roughly 18 minutes worth�as well as an outtakes reel (01m:31s) found on the original release, while new stuff is access to The Boondocks Saint script, accessible via your computer, presented in Word format. The film is cut into 24 chapters, with optional subtitles in English or Spanish. If you already own the 2002 release, the question of whether to upgrade stands on the strengths of the metal case packaging and the new 5.1 EX mix, because really the only new supplements are a Billy Connolly commentary and access to the script. The transfer is anamorphic, improved but not flawless, but it's the audio that really boosts this one. Violent, clever, and perpetually foul-mouthed, The Boondock Saints operates in a weird fantasy world of working-class South Boston populated by cartoony crime bosses and colorful oddballs. And shooting. Lots and lots of shooting.